IAOP recognized N-iX in the 2018 Global Outsourcing 100 list as Top Company in four specified categories: Customer References, Awards & Certifications, Programs for Innovation, Programs for Corporate Social Responsibility. As we have mentioned in our previous post, N-iX was featured in the 2018 Global Outsourcing 100, the annual list of top companies published at the beginning of a year by the International Association of Outsourcing Professionals (IAOP). Later on the same year, IAOP shares the companies’ scores in a number of categories and top listings regarding each category criteria: size & growth, customer references, awards & certifications, programs for innovation, and corporate social responsibility. Last year N-iX got distinguishing stars in three categories. 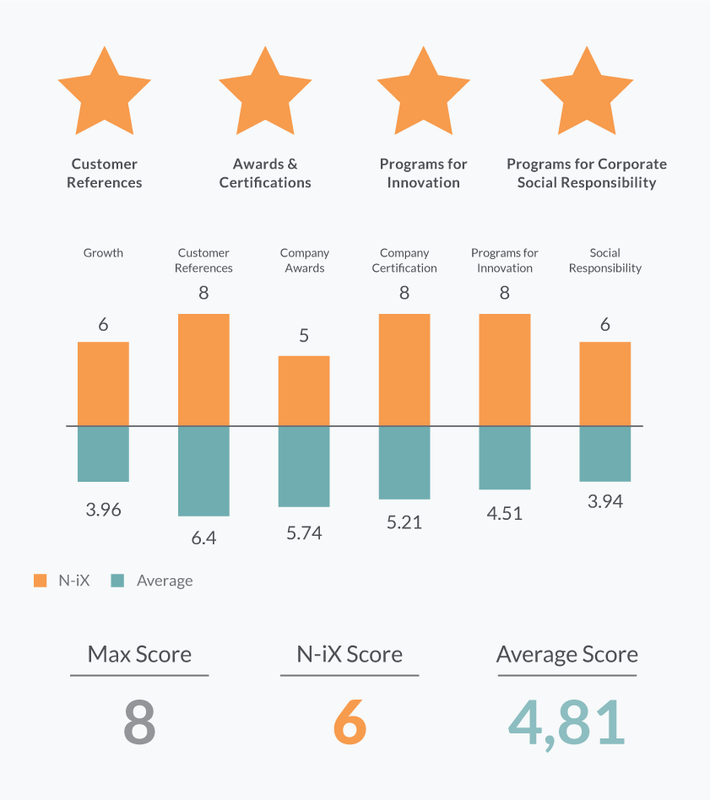 In 2018, N-iX is listed as a Top Company for Customer References, Awards & Certifications, Programs for Innovation, Programs for Corporate Social Responsibility. N-iX showed maximum excellence – 8 out of 8 – in three categories: Customer References, Company Certification, Programs for Innovation. Besides, our company got an appreciable score – higher than the average – in the number of other categories: Programs for Corporate Social Responsibility, Awards & Certifications, Growth, Size & Growth. The overall N-iX score is higher compared with the total average.